I'm happy to report that I've got my KnitPro Karbonz 4mm tips back! The size is one of the most used ones so I was eager to get my replacements. Kudos to KnitPro - reclamation via the store I bought them at, new ones were there within a week without any problems! 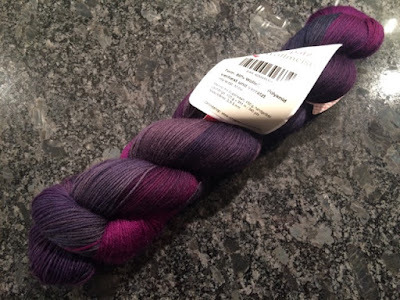 It's a 80% merino/20% polyamide blend, and this time I'm hard-pressed to find a translation for the name... "Verhext und verratzt" - jinxed and ??? Anyway, I'm sure I'll find a beautiful project to use this for, quite probably something without much texture or complicated pattern as the yarn will be playing out beautifully by its own.